This was my second attendance of the Pain Management course, which was week 3 of the 8 week programme. 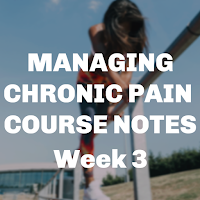 There were a few new members who I didn't recognise, because they had attended week 1 (which I didn't go to) and skipped week 2, which I did go to, but I guess a pain management course is going to be a bit hit and miss with attendance. 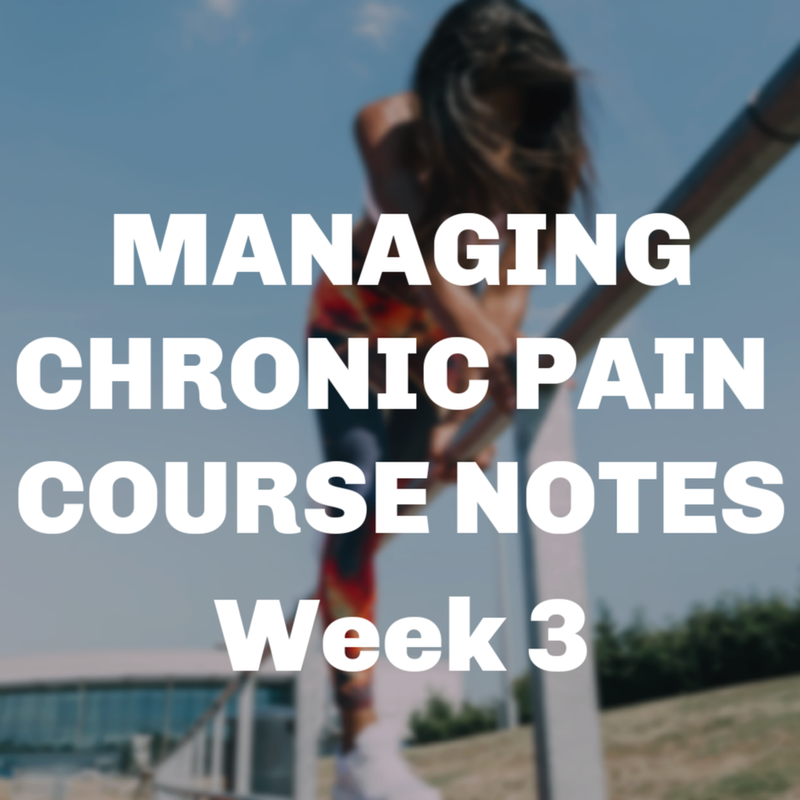 It is advised to try to attend all parts of the course to get the most benefit, but it is a little bit flexible as going anywhere when you suffer from pain can be a struggle, particularly when it's a set time each week. This week's theme was Problem Solving. We started by updating the group on our progress from the previous week. At the end of each session, we have to set a goal of something we are going to try to achieve by the following week and mine was to not over do it by going to the gym too often. I set a goal to only go twice, which seemed a bit of a cop-out, but apparently it's just as important to not do too much as it is to do enough. Since I am very stubborn and don't know when to stop, it was a good goal for me. I did achieve it and it was nice to listen to how everyone else got on. Some managed it and some didn't and we talked a bit about measuring success and a step forward still being worthwhile, even if you don't get to the end. That is one overriding factor of this setting, you are amongst people who understand the drawbacks of pain and so it's a very supportive atmosphere. I wondered how I would be in a group environment, as I get nervous in crowds, but there's only about ten of us and the group leaders are very good at making everyone feel welcome and comfortable. After we had discussed our successes, we moved on to thinking about activities we do and why we find them difficult. An activity could be something fun, like going to the theatre, or something mundane, like housework or gardening. Once we'd all come up with an idea, we broke off into small groups and tried to come up with things we could change to make the activity easier to complete. For example, one problem that was suggested was trying to cut a large plot of grass. One of the solutions was to divide the lawn into three sections and have a break between each one. It might sound obvious, but what I learned from all the problems and solutions was that you can achieve something, or do something you want to do, without half killing yourself in the process, if you change the way you do it. We are so conditioned to just get on with things, that it was good to rethink ways of doing things to change the outcome. One of the themes that keeps coming up is balancing what you have to do, taking care of children, holding down a job, etc, with what you also want to do, but isn't so essential, like social activities and hobbies. There followed a role play featuring a doctor and patient. There were two versions; in the first, the doctor didn't explain much about the patient's condition and the patient left feeling confused and a bit scared, because they didn't know what was really causing their pain condition and they were afraid it would get worse, or they might make it worse. In the second, the doctor explained the patient's condition, and what had caused it, and the patient asked better questions too, so the patient felt informed and reassured that they could take part in activities without making their situation worse. Then we watched a video, embedded above, which confused me a bit. The first part stated that; 'Most things in the body are healed as much as they can be by three to six months' which doesn't make sense, because 'as much as they can be' means they may not be healed. Everyone's pain experience is different, but, in my case, I have herniated discs in my spine. They can't be fixed, because surgery is too much of a risk, so they are still there and they press on nerves, causing pain. So, looking at my own situation, I felt the first part of this video might be an oversimplification in some cases. However, there was a lot of good advice in there too, particular the section on stress responses. I know I feel worse if I'm upset or unhappy. I have also noted personally that diet can make a difference, and finding an exercise that I can do without fear of making it worse has helped too, so do give the video a watch, as there are lot of informative bits in there, once you get past the feeling that they might be suggesting it's mainly in your head! When I mentioned the Wheel of Life to L, this is what he thought it should look like. The version we had was just a plain black and white pie chart, but I might suggest this as an improvement. 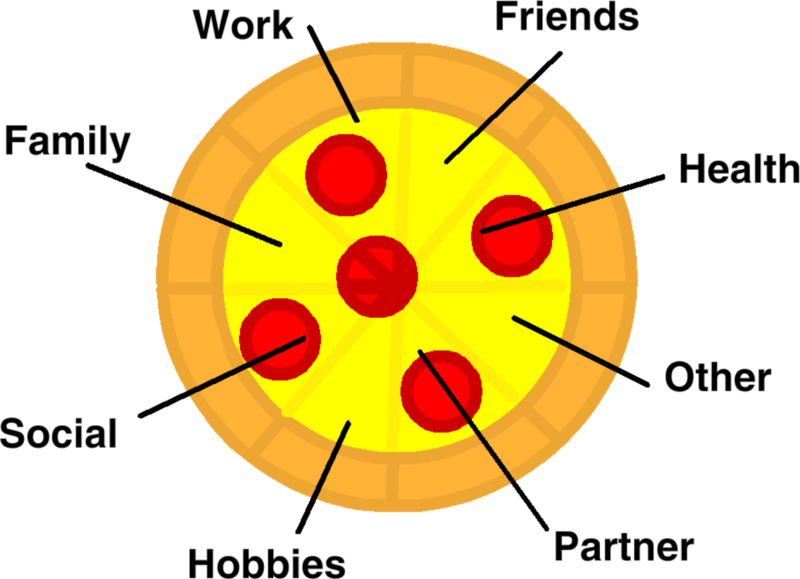 Everyone loves pizza. Next, we filled in a Wheel of Life, which had various sections that are part of everyday life, such as work, family, hobbies, etc, and you had to put a score next to each one, depending on how good you felt about it, or possibly how satisfied, whichever way you look at it. It was first explained that no one is completely satisfied with every aspect of their life, regardless of whether they have a pain condition, so we shouldn't be too despondent if we don't get a perfect score. After we had finished scoring our lives, we discussed our lower scores and why we felt that way. Overriding feelings that kept coming up were guilt and frustration about various aspects, particularly around children and family and we talked about ways to improve things. After this we set our goals for the following week. Since I had expressed feelings of guilt around spending time with my children, I chose addressing that as my goal for the following week. I pledged to talk to the children and find things we could do together that would still be enjoyable for them but manageable for me, so that I don't regret it the following day! This was the end of the session and I'm pretty confident I've left some things out, but for some reason I really struggled to concentrate, or even stay awake, so I'm not sure all of it went in. The group leader also runs the fatigue course and she thinks my tiredness is due to stress about the course, so hopefully as I settle into it, I will be a bit more present!